Amid all the busyness of the holiday season, it’s important to take time to care for ourselves. We all want to be healthy and stay safe in order to make the most of this special time of the year. Making a few adjustments to some of our regular habits can help. One thing we should all focus on is getting enough sleep. We know it’s important to eat healthy foods to counterbalance (and hopefully lessen cravings for) all the goodies. Adding exercise to our routines also makes a lot of sense. How else will we burn those extra Christmas cookie calories? Just as important as these two practices is making it a goal to get enough sleep. Getting enough sleep is critical to staying healthy and happy, during the holidays and every other time of the year. The importance of getting enough sleep cannot be overemphasized. The current recommendation (check out this chart) by the National Sleep Foundation is that adults should get 7-9 hours of sleep per night. Children and teenagers need more than that. How many of us actually get the recommended amount on a regular basis? Sleeping is one very important practice that keeps the immune system, brain, heart and other organs and bodily processes healthy. 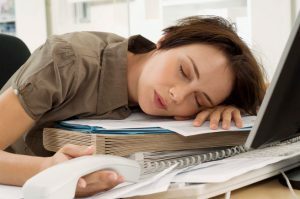 Not getting enough sleep negatively affects just about everything we do during our waking hours and has both immediate and long-term effects on health and safety, according to the National Heart, Lung and Blood Institute. Short-term issues include changes in thinking and functioning. A sleep-starved brain is subject to unclear thinking as well as behavioral and emotional problems. Have you fallen asleep at your desk lately? Had any pointless arguments after a poor night’s rest? Another very serious consequence of sleep deprivation is the increased risk of driving accidents. Driving while sleep deprived is just as dangerous as driving drunk and contributes to approximately 100,000 car crashes and more than 1,500 deaths per year, according to the National Highway Traffic Safety Administration. Learn more at the National Sleep Foundation website. Long-term health problems associated with extended periods of not getting enough sleep include increased risks of obesity, heart disease, high blood pressure, stroke and more. Visit the National Heart, Lung and Blood Institute website to learn much more about why sleep is so important. Make this season more healthy, safer and more enjoyable by getting enough sleep!